Since 1989, Silicon Valley-based Diamond Systems Corporation has provided rugged, I/O-rich embedded computing solutions to companies in a broad range of markets, including transportation, energy, aerospace, defense, manufacturing, medical and research. Our products are based on industry-standard embedded buses and form-factors such as PC/104, EBX, EMX, EPIC, ETX, and COM Express. Our extensive line of I/O expansion modules includes analog and digital I/O, counter/timers, serial communications, wired and wireless networking, GPS, solid-state disk, and DC/DC power supply functions. 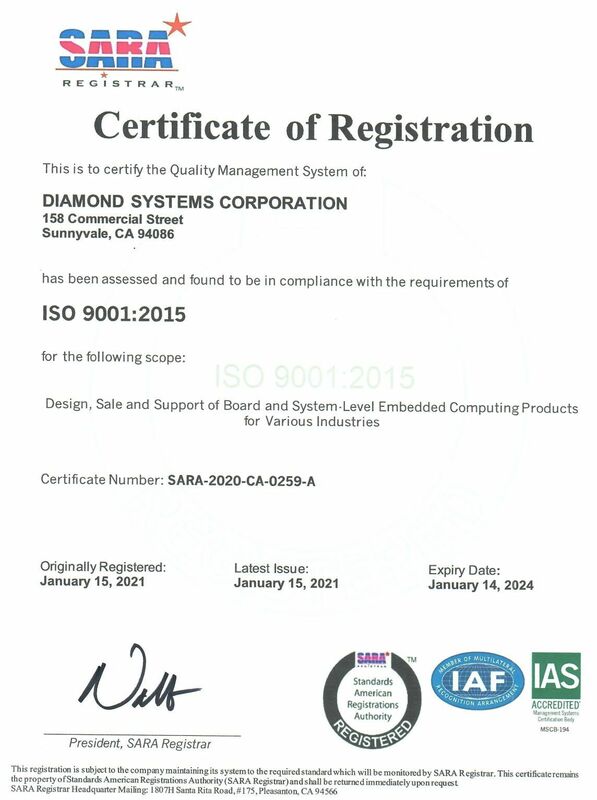 Diamond Systems is an ISO 9001:2015 certified company. We also maintain a global network of ISO 9000-certified manufacturing facilities, including locations in the U.S. and Far East. Our scalable manufacturing infrastructure allows us to quickly scale up to almost any production volume requirement as well as to locate the manufacturing as needed to suit policy or logistics requirements. Each production unit undergoes full-function production test, with test results archived in an online database. All of our product configurations are maintained under strict document control, guaranteeing consistency of design, component selection, and performance during the entire life of the product. Diamond is focused on delivering successful solutions for demanding real-world applications and bringing value to our embedded customers across many markets. Our customers benefit from single-supplier convenience, proven compatibility among system components, lower product development costs, and quicker time-to-market. Learn why Diamond should be your embedded technology supplier.